(Nanowerk News) A team of scientists at the Wyss Institute for Biologically Inspired Engineering at Harvard University and the Harvard John A. Paulson School of Engineering and Applied Sciences has evolved their microscale 3D printing technology to the fourth dimension, time. Inspired by natural structures like plants, which respond and change their form over time according to environmental stimuli, the team has unveiled 4D-printed hydrogel composite structures that change shape upon immersion in water. "This work represents an elegant advance in programmable materials assembly, made possible by a multidisciplinary approach," said Jennifer Lewis, Sc.D., senior author on the new study. "We have now gone beyond integrating form and function to create transformable architectures." Reported on January 25 in a new study in Nature Materials ("Biomimetic 4D printing"), the 4D printing advance combined materials science and mathematics through the involvement of the study’s co-lead authors A. Sydney Gladman, who is a graduate research assistant advised by Lewis and specializing in the printing of polymers and composites at the Wyss Institute and SEAS, and Elisabetta Matsumoto, Ph.D., who is a postdoctoral fellow at the Wyss and SEAS advised by Mahadevan and specializing in condensed matter and material physics. "Using one composite ink printed in a single step, we can achieve shape-changing hydrogel geometries containing more complexity than any other technique, and we can do so simply by modifying the print path," said Gladman. "What’s more, we can interchange different materials to tune for properties such as conductivity or biocompatibility." "Our mathematical model prescribes the printing pathways required to achieve the desired shape-transforming response," said Matsumoto. "We can control the curvature both discretely and continuously using our entirely tunable and programmable method." Specifically, the mathematical modeling solves the "inverse problem", which is the challenge of being able to predict what the printing toolpath must be in order to encode swelling behaviors toward achieving a specific desired target shape. "It is wonderful to be able to design and realize, in an engineered structure, some of nature’s solutions," said Mahadevan, who has studied phenomena such as how botanical tendrils coil, how flowers bloom, and how pine cones open and close. "By solving the inverse problem, we are now able to reverse-engineer the problem and determine how to vary local inhomogeneity, i.e. the spacing between the printed ink filaments, and the anisotropy, i.e. the direction of these filaments, to control the spatiotemporal response of these shapeshifting sheets." 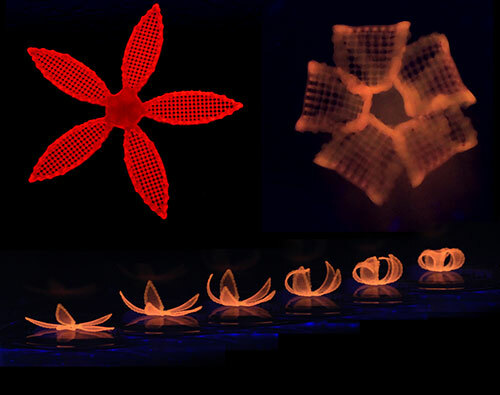 "What’s remarkable about this 4D printing advance made by Jennifer and her team is that it enables the design of almost any arbitrary, transformable shape from a wide range of available materials with different properties and potential applications, truly establishing a new platform for printing self-assembling, dynamic microscale structures that could be applied to a broad range of industrial and medical applications," said Wyss Institute Founding Director Donald Ingber, M.D., Ph.D., who is also the Judah Folkman Professor of Vascular Biology at Harvard Medical School and the Vascular Biology Program at Boston Children’s Hospital and Professor of Bioengineering at Harvard SEAS.